The League of Women Voters was formed in 1920 as an outgrowth of the movement to give women the right to vote following the passage of the 19th amendment to the U.S. Constitution. That amendment was ratified in 1920, after a 57-year struggle. 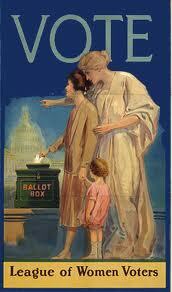 The League was characterized as a "mighty political experiment" designed to help 20 million women carry out their new responsibilities as voters. It encouraged them to use their new power to participate in shaping public policy. Read the History of the League and its impact in the County. The document was compiled as part of the 60th anniversary in 2011. Since 1910, the League has indeed helped improve the general welfare of the people. Some of the League's earliest causes included support for child labor laws, minimum wage, compulsory education and equal opportunity for women. Some of these issues affected the creation of laws that are still in force today.